Maria Treadwell, East Coast coordinator for SI. 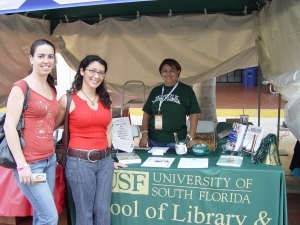 The USF School of Information was represented in the 2010 Miami Book Fair International during Nov. 20-21. 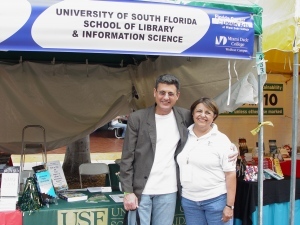 SI had a booth at the fair to advertise its degree program and network with alumni. SI’s East Coast Coordinator Maria Treadwell and Communication and Information Officer Jessica Voss attended represented the school at the fair. SI’s booth was a hit this year at the fair. The interest in its programs by fair goers was very high. Many LIS adjuncts, alumni and current students were excited to see SI's presence at the fair and stopped by to catch up with the staff. More than 75 prospective students were anxious to stop and get information on SI's master’s program. The street fair included the Festival of Authors, with more than 350 authors reading and discussing their work and the more than 250 publishers and booksellers exhibits. Thousands of South Florida schoolchildren kicked off the Street Fair, making the trip downtown Friday to hear authors and participate in Children’s Alley activities. The street fair was full of surprises with performers on stilts and mariachis singing. Here are a few pictures we captured.